Admiral is a fawn male with natural ears, between 2-3 years old. He was an animal control seizure for abuse and neglect. 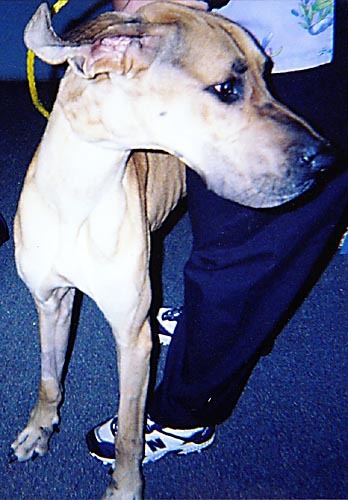 The owner had 4 other dogs that were all fat and healthy, but this poor dane belonged to her husband whom she hated. So to get back at her husband, she confined the dane and purposely tried to starve him to death. As a full grown adult male, he weighed a whopping 72 pounds. his cheek bones were sticking out of his face farther than his eyes that were sunken into his skull. DISGUSTING! He is currently at the animal emergency clinic because of severe pancreatitis. They did not know if he would even live thru the night due to the malnutrition.